Trombonist/Arranger/Composer Melba Liston was born in Kansas City, MO on January 13, 1926. In her early years, she shuttled back and forth between the and Kansas City, KS, where her grandparents lived. She got her first trombone at seven, when a traveling music store brought instruments to school. By the time she was eight, she was playing solo trombone on local radio shows. When Melba was eleven, her family moved to Los Angeles. There she was mentored by a local music teacher, who ran a big band made up of neighborhood children. That relationship ended after four years, when Melba decided to join the musicians union, against the teacher’s wishes. Nevertheless, Liston joined the pit band at Los Angeles’ Lincoln Theatre at age sixteen. When the Lincoln discontinued live shows in 1943, Liston joined the new band being formed by Gerald Wilson. She also recorded in a group with old school pal Dexter Gordon. Melba stayed with Wilson for five years, until his group disbanded. She then joined Dizzy Gillespie’s Big Band, along with Wilson. That lasted about a year, until Dizzy’s band also broke up. After joining Wilson again in a Bebop band that backed Billie Holiday on an ill-fated tour of the South, Ms. Liston gave up music for a few years. She took a job with the Los Angeles Board of Education. Music, however, was not completely out of her blood, as she continued to compose and arrange on the side. She even tried her hand at acting for a while, landing bit parts in The Prodigal, alongside Lana Turner and in The Ten Commandments, as a harp player. But the music was never far away from Melba’s heart, so when the State Department asked Diz to form a big band for a Middle East/Asia tour, he coaxed Liston into joining him. Though she rarely soloed during that time, she did a considerable amount of arranging. Including “Stella by Starlight”, “My Reverie” and “Wonder Why”. These arrangements (and more by Melba) were recorded and can be heard on the Birks Works compilation, on Verve. Diz wasn’t the only one who dug Melba’s arranging. Quincy Jones, who played trumpet in the Gillespie band at the time, was forming a band to tour Europe. he asked Ms. Liston to join him and she agreed. 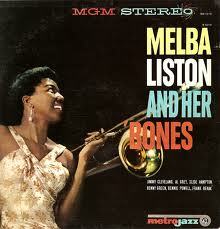 In 1958, Melba Liston recorded her sole album as a leader; Melba Liston and Her Bones. On this date, Liston and an array of trombonists, including Slide Hampton, Al Grey and Bennie Green, were front and center, with solid support from Kenny Burrell, Ray Bryant, Charlie Persip and others. Co-produced by Leonard Feather, it’s a shame that this fine album drifted into obscurity. In that same year, Melba met pianist composer Randy Weston. Weston admitted that at the time, he had never met a woman trombonist before. Their meeting sparked a creative partnership that lasted almost 40 years. Weston initially hired Melba to put some meat on the bones of his compositions. They realized quickly that musically, they were two halves of the same coin. Said Weston; “Melba is incredible; she hears what I do and then expands it. She will create a melody that sounds like I created it. She’s just a great, great arranger.” All in all Weston and Liston worked on 10 albums together, including Little Niles, Earth Birth and Volcano Blues. Besides her work with Weston, Melba continued to freelance, working often with Clark Terry and briefly with Charles Mingus. Upon her return to Los Angeles in the late ’60’s, the pop music world took note of her talents and she arranged sessions for stars including Marvin Gaye and the Supremes. Ms. Liston was very active until 1986, when she suffered the first of several strokes. She had to give up playing and was confined to a wheelchair, but Melba continued to compose and arrange, until her death in 1999. Melba Liston – most of her career was spent behind the scenes, but her work was always headliner quality. This entry was posted on September 24, 2011 at 11:28 pm and is filed under Unsung Women of Jazz with tags dizzy gillespie, jazz, jazz trombone, melba liston, randy weston, Women in Jazz. You can follow any responses to this entry through the RSS 2.0 feed. You can leave a response, or trackback from your own site.